Is SO2 the Real Threat – not CO2? It has snowed in Alberta, Canada on August 1st in the dead of summer. Such strange events like this have not been common. Europe is burning from heat when buildings do not even have air conditioning because they never needed it. The concern that we are headed into a volcanic weather event really needs our attention. Volcanos emit C02, but they are a major source of something far worse – SO2. We have all heard of the London Fog. However, in 1952, some 4,000 people in Britain died from breathing in the fog. The London Fog of 1952 resulted from burning coal excessively because it was a bitterly cold winter. This produced sulfur dioxide in the lower atmosphere, which may have reached 7 times normal levels. This became the perfect storm. The air was stagnant and there was no real wind. This combined with high humidity to create a very dense fog. Once the sulfur dioxide was trapped by the fog combining with the high humidity of water vapor, this deadly combination produced sulfuric acid, which many call today acid rain. Despite all the claims of CO2, it is really SO2 that can become lethal. We have learned about SO2 and have been reducing human emissions since the London Fog of 1952. Despite the constant focus on cars and CO2, it is Power plants and motor vehicles that burn sulfur-containing fuels, especially diesel, that create SO2. It is the Sulfur dioxide that can react in the atmosphere to form fine particles of acrid rain that pose the largest health risks to the atmosphere. CO2 does not have the same effect. This is what the major movement has been for clean air – reducing SO2. Volcanos emit a lot of Sulfur dioxide (SO2) which smells like rotten eggs. Humans also contribute by burning coal and other fossil fuels which are the largest source of sulfur dioxide from human activities. However, volcanoes and forest fires are THE major natural contributors. 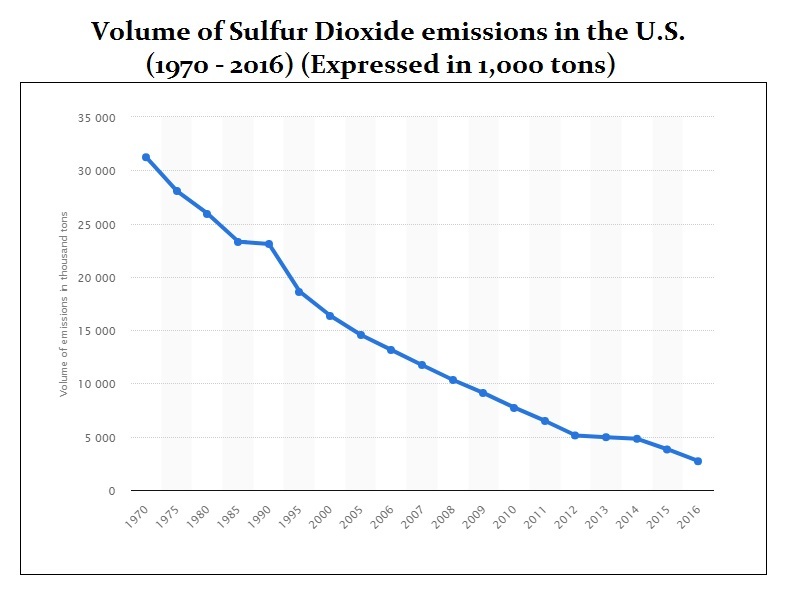 What is important to understand is that sulfur dioxide is a pollutant that does impact the climate. Once SO2 is in the atmosphere, it can easily form sulfate ions. These are negatively charged particles made of up of sulfur and oxygen atoms. Since they are negatively charged, sulfate ions combine with water vapor in the atmosphere and then form small droplets of sulfuric acid (H2SO4). You may hear of this as acid rain. CO2 does not act in this manner. When a volcano erupts. we then see huge amounts of sulfur dioxide are released into the stratosphere which will then convert to sulfates. 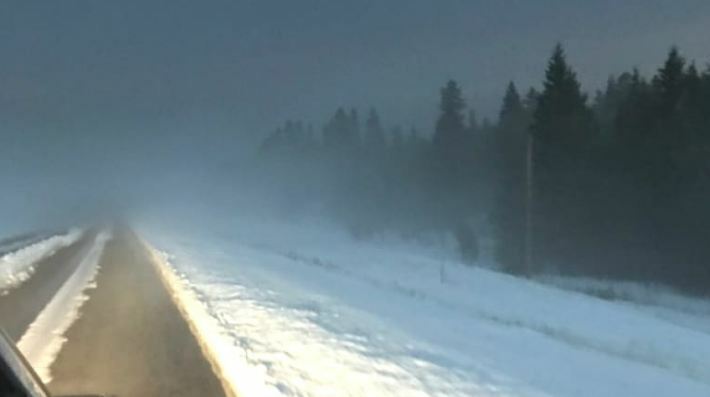 There is a qualification needed here because sulfates formed at lower altitudes are removed from the atmosphere in just a few weeks through settling and precipitation. However, the SO2 emission from volcanos reach the upper bounds of the atmosphere and create aerosols that are mainly tiny droplets of sulfuric acid that then stay in the atmosphere for about two years. These SO2 droplets reflect incoming solar radiation back into space yet absorb both incoming solar radiation and outgoing infrared radiation. The net result, is simply that SO2 reduces the amount of energy reaching the lower atmosphere and Earth’s surface. Hence, we get global cooling of the lower atmosphere and Earth’s surface. Consequently, it is the volcanic eruptions that are of considerable impact on global climate and are a proven fact rather than theory as is the case with CO2. Following the eruption of Mount Pinatubo in 1991, a cooling trend lasted through 1993. This was attributed to the sulfuric acid aerosols that persisted in the stratosphere. Historically, there was a global cooling which followed the 1883 eruption of Krakatoa. The worst such event was the “Year without a summer” which followed the eruption of Tambora in 1815. The other school of thought has been where many scientists believe that the continuous emission of sulfates would counter any greenhouse gas theory of CO2. As volcanos tend to erupt when the energy output of the sun declines as has been taking place since 2015, we are experiencing uneven concentrations of sulfates around the world. This may be a major issue in turning places that are normally warm to cold and cold to warm. The problem with SO2 is that it remains in the atmosphere much longer and hence the continued trend of erupting volcanos can seriously alter the climate for even more than a decade ahead.